Greek Forum of Migrants in cooperation with the Norwegian Centre Against Racism will implement a project, named “fight hate crime now” from November 2014 to August 2015. The normalization of aggressive and verbally abusive speech toward people deemed to be “different” such as migrants, homosexuals, and Roma, has contributed to the increasing level of violence enacted against minorities which have become a regular occurrence in many parts of Athens and in other regions of Greece. On the other hand, there is no state or non-state apparatus to address the matter, except from the network for recording incidence of racist violence. Essentially we are trying to broaden the scope of the existing network by recording of racist violence in all its manifestations. Also the role of migrants in the recording process so far has been lacking, which we want to change through their active participation in the project. The migrants themselves will be able a) to identify the victims, b) to better explain that what happens to victims of racist violence is a crime, c) be linked more systematically and actively with existing Network log. This project is funded by the Greek NGO Programme “We are all Citizens” which is part of the EEA & Norway Grants for Greece. 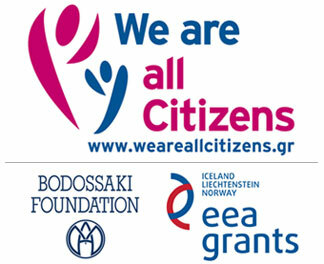 The Bodossaki Foundation is the Fund Operator of this Programme. The Programme aims to strengthen civil society and enhance the contribution of NGOs to social justice, democracy and sustainable development.